31 Jan Filed under Uncategorized. Tagged Blog, ideas, procrastination, skyrim. Bookmark the permalink. Post a comment. Leave a Trackback (URL). You know, I have a bunch of ideas for posts. Little rays of sunshine (or moonlight for those negative posts) I’ve got stuffed in my writing pocket ready to radiate upon my readers’ pale bodies. Some have been rattling in my head since I started this damn thing and some have just popped up within the last few days. I hold off on them because there’s not enough time, some other idea comes up or I’m holding off till the right day to come along. Oh . . . It felt like literary genius in my pocket. 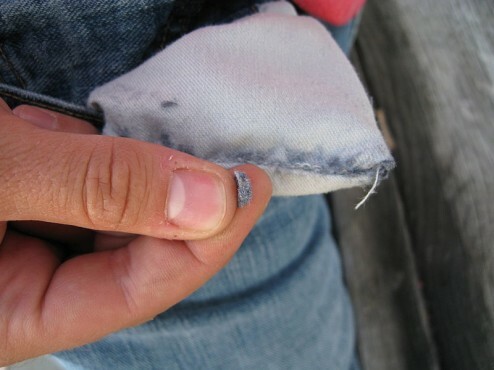 Turns out it was just ordinary lint. Want to buy some lint? Like today, I have a great idea for a post – I think it will be enlightening and entertaining and probably win me a pulitzer (or an Emmy or Tony or something. At least I’ll win a comment from my mom.) but it’s best suited for this coming Super Bowl Sunday than it is now. And anyway, many of my posts should be about the current day – something that’s inspired me . . . or Megan. She inspires me. However, today, I’m still reeling from yesterday’s 14 hour work-a-thon. So, I’m giving you all a little taste, a little morsel of what’s to come. Here a small, but fascinating list of blog posts to come. 25 Blog Ideas for the Future! Except that guy at Starbucks who smells like piss. You can't read this . . . because you smell like piss . . . and probably don't own a computer . . . because it left you . . . because you smell like piss . . .
2) 5 Fashion Trends that Need to Die. 3) 3 Internet Business Ideas I never Cashed in On. 4) What’s Up With the New X-Men and Never Taking Off Their Costumes? 5) The Sketch Ideas that Didn’t Make it Out of My Idea Notebook. 6) Why Team Loony Tunes would beat destroy Team Disney in a Battle Royal. 12) I’m On The Run From The Law . . . no Seriously. Somebody Tell Megan. 13) Top 10 places to Hide When You’re wanted by the law . . . no Seriously. Somebody Tell Megan. 14) The Guard Won’t Give me my Phone Call . . . no Seriously. Somebody Tell Megan. 15) Prison Break! . . . no Seriously. Somebody Tell Megan. 22) “I’m a Millionaire” and other things I hope to scream one day. 23) Romeo And Juliet, staring TMZ and Perez Hilton. 25) This Blog is DONE! So, I hope this list made you salivate. I hope you’re just gnawing on your fingernails in anticipation of the glorious words that will appear under those titles. I hope . . . I hope . . . I think Skyrim in calling . . .
Oh, there's my pocket full of sunshine. 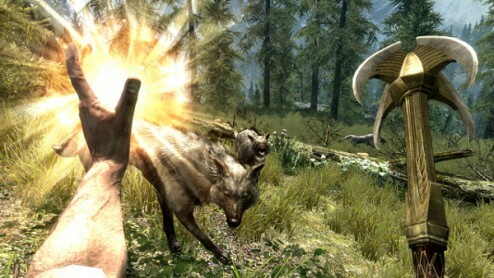 I was saving THAT for those f'ing wolves that plague Skyrim!